We’d been working on developing a cutting edge beer for two years or so, and we were able to perfect the recipe recently. Unfortunately, we ran into some rights issues with the working name we’d been using. But we’re brewers and craft beer geeks. When we run into obstacles, we see opportunities. We realized this was our chance to see what the people who drink our beer think. Hey, if you like us, then we respect your opinion, because we know you know what’s good. So we’re asking for your help in choosing a name and a label for this new beer. Now, imagine yourself sitting around a table, beer in hand, brainstorming with a bunch of brewers, cellar masters, packaging whizzes, and other beer geeks. A description. The beer you’ve been waiting for. Keeping your taste satisfied while keeping your senses sharp. An all-day IPA naturally brewed with a complex array of malts, grains, and hops. Perfectly balanced for aggressive aromatics, moderate bitterness and a remarkably clean finish. It’s the perfect companion for tall tales around the bonfire, working around the yard, or introducing great craft beer to your Uncle Ernie and Aunt Claudia. Tasting notes. Fresh and hoppy, tropical fruits, oats and wheat. Ingredients. Three varieties of malts, Simcoe and Amarillo hops (among others). The accolades. Won a silver medal at the 2010 GABF. The Rockery is hosting an IPA tasting on Wednesday April 6, 7-10PM. $20 cost for 15 beers and food! Annette May, Certified Cicerone and Beer Department Manager of Merchant’s Dearborn and her husband, will be on hand helping guide customers through the selections. The (new) Rockery boasts 4 taps- 3 Michigan taps (currently Founders Old Curmudgeon, Arcadia Whitsun, & Kuhnhenn DRIPA), and Blatz “for the old customers.” And, about 40 Michigan bottles, including the hard-to-get Kuhnhenn 4th Dementia and Jolly Pumpkin iO Saison. Here’s the beer menu. It’s inexpensive, and they have a special price for a “Michigan Beer Bucket” ( 5 Michigan brews, with the exclusion of a couple of brands, for $14. Basically almost what you would pay for the same beers in a retail store. A fantastic deal!) They have a nice selection of imports too. And live music on Fridays. The kitchen sticks to the basic burgers, chicken strips and the like, though all the ingredients are sourced locally. Bell’s beer – in a can! 03/31/2011 7:10 AM By Chris Knape Gazette News Service KALAMAZOO —Bell’s Brewery Inc. is planning to install a 500-cans-per-minute canning line at its Comstock Township facility by spring of 2012 as part of an on-going expansion project, president Larry Bell said Wednesday. 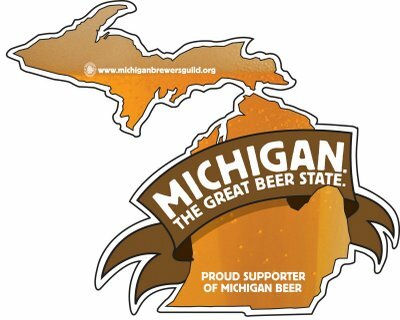 (LANSING, Mich – email press release) – One of the benefits of membership in the Michigan Brewers Guild “Enthusiast” program is special VIP tours and tastings at member breweries around the state. To participate in one of these special tours, one must be a current Enthusiast member – a group dedicated to celebrating the growing craft beer industry in the Great Lakes State. Enthusiast memberships are $35 each and are available online at www.michiganbrewersguild.org/beernut.asp. There is no additional charge for the tours, but reservations are recommended and attendees must show their Enthusiast card. Get behind the scenes of this popular brewery – ask questions, sample beer and get a chance to experience the other side of the bar stool. Join Jon Wojtowicz – Beer Liberator from Short’s. Get behind the scenes of this popular brewery – ask questions, sample beer and get a chance to experience the other side of the bar stool. Join Russ Springsteen for a spring tour of Right Brain Brewery. Join brewer Konrad Connor for a brewery tour and beer. Enthusiast Members will receive either Happy Hour pricing on select beers, or $1 off all other pints (10% off food too). If you are already a MBG Enthusiast Member, then please contact Karen@MichiganBrewing.com to reserve your spot today. There will be two tours to choose from, 1-2pm and 2-3pm.There is a limit of 20 spots for each tour. If you are not currently an Enthusiast Member, then please sign up, and then contact Karen at the email address above. We ask that members bring their ID card or some other proof of membership on the day of the tour in order to receive the membership perks, which include $1 off pints during your visit that day & 10% off any purchase made in our retail store. RSVP: Laura Bell at LSBell@bellsbeer.com for a guided tour through Bells’ Brewery. Join Joe Walters for a guided tour through Liberty Street Brewing Co.
Come to New Holland and tour our brewing facility for a guided tour through our new expanded warehouse. The tour will include a special tasting of our beers. Also to note this is during our Mad Hatter Days Anniversary weekend, where a number of Hatter Day beers will be on tap as well as a beer and cheese smackdown at the pub. Be sure to join all the festivities! We will be sure to provide our enthusiasts with a behind the scenes tour, Happy Hour Prices with a free pint glass, and instant access to our loyalty program and pricing. Within the next month, or shortly thereafter, Arcadia Brewing Co. in Battle Creek will have a new option for its customers –ale from cans. Tim Suprise, founder and president of the brewing company, says he has purchased oa canning line that will be installed at its downtown Battle Creek production facility. The first ale to be produced in cans will be the company’s spring/summer seasonal, Whitsun. The design for the new can is being finalized this week. Suprise says, for fall, a second product, Sky High Rye, will be added. Click here to read rest of article. Sorry I have been remiss in getting you up-to-date event info. I’ll send a more comprehensive listing in the next few days but I wanted to make sure you knew about all of the great Dark Corner events we have planned for the next two weeks. For those who weren’t around in 2007 when we launched the Dark Corner project, it is a Corner Brewery/Dark Horse collaboration beer. Owners Aaron and Matt developed a fabulous Imperial Brown recipe that was brewed at both locations. One of our good friends (who happens to also be a very talented artist) developed a kick a%! collector’s label and six pack. Six packs that you buy in the stores will contain 3 of our beers and three of Dark Horse’s beers. (Due to state law, you can’t purchase mixed six packs at either brewery – but can only get our beer at Corner and their beer at Dark Horse). We did the project once in 2007 and then both got too busy to do it again – until this year. We are co-hosting multiple releases with our friends from Dark Horse that we know you won’t want to miss! TOMORROW NIGHT – Tuesday, March 29 6-8 pm – This is the official Corner Brewery release which means that it is free to mug club members and a mere $10 for guests. We’ll be pouring our version of the Dark Corner and selling six packs. This will be you first chance to taste this year’s recipe and get your hands on a Dark Corner six pack. Matt and Aaron and the brew-team will be on hand for sixer signing. WEDNESDAY NIGHT – March 30 – 5-9 pm – This is the official Dark Horse Brewing Company release and will feature Dark Corner at happy hour prices. 511 S. Kalamazoo Ave, Marshall, MI 49068, Phone: 269-781-9940. There is a group of about 12 of us going from ABC and Corner and we’d love to get some more of our peeps out (if you’re not too hungover from Tuesday night!) Matt and Aaron and the brew-team will be on hand for sixer signing. Friday, April 1 – 4pm-7pm – Official Ann Arbor Happy Hour Release at Whole Foods Cranbrook – Featuring both versions of the Dark Corner on draft. If you’ve never checked out the Whole Foods bar, this is a great excuse. Great cheeses, great local beers on tap, and you can drink while you shop (or shop while you drink). 990 W. Eisenhower Parkway – Ann Arbor, MI 48103 USA – map, directions & nearby stores Phone 734.997.7500. Matt and Aaron and the brew-team will be on hand for sixer signing. Friday April 1 – 8pm– 11pm – Ashley’s Official Ann Arbor Evening Release Party – In addition to both Dark Corners, Ashleys will be serving up a two year old Flamboyant Wild Red (there’s only a 1/6 bbl of it so get there early! ), Ryeclops Imperial Rye, Hoptown Brown, Espresso Love, and a firkin of cask-hopped Arborealis. They will also have several specialty taps from Dark Horse. If you live in Washtenaw County then Ashley’s needs no introduction but here’s the address just in case. 338 South State St, Ann Arbor, MI 48104 734-996-9191. Matt and Aaron and the brew-team will be on hand for sixer signing. Full Pint’s Dan Becker got confirmation from Marketing Coordinator, Hanna Laney, that Great Divide Brewing is pulling out of Michigan, Rhode Island, Delaware and Connecticut due to “exponentially increasing orders.” The brewery will also pull out of DC and southern and central VA according to TFP. Great Divide President, Brian Dunn, actually notified distributors weeks ago and rumors trickled out from insiders over the past month. Click here to read rest of the story. Why buy local Michigan Beer?